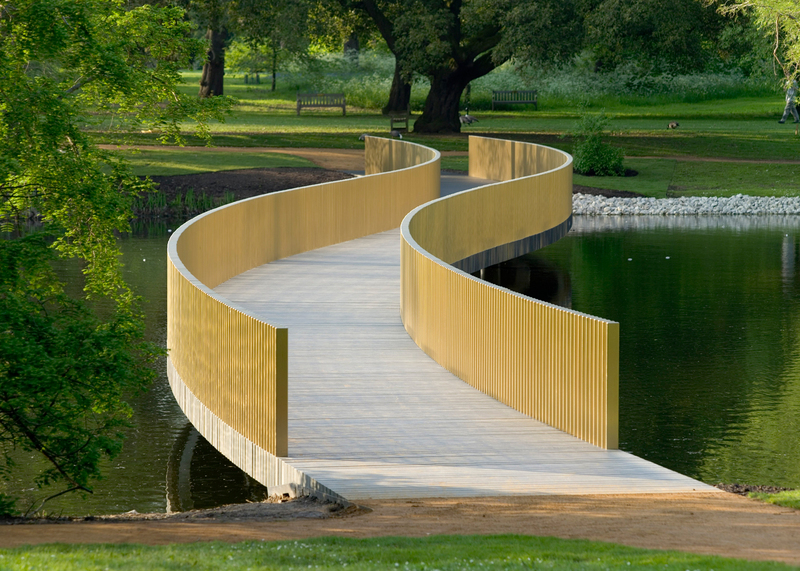 John Pawson's serpentine crossing over a lake in the Royal Botanic Gardens at Kew, England, is the latest addition to our alphabetical countdown of iconic contemporary bridges. Completed in 2006, the Sackler Crossing is a 70-metre-long winding pathway across a lake in the centre of the 120-hectare gardens. It was developed by London-based Pawson as part of a wider project to encourage people towards seldom-visited parts of the park, leading towards the Japanese Minka House, Bamboo Garden and Brentford Gate. The bridge sits as close to the water as possible. The aim was to create the impression of a lightweight structure floating on the surface. Its concrete and steel structure is completely concealed. The only visible elements are granite treads laid in a row like railway sleepers, and a balustrade of bronze uprights. Writing in the Observer shortly after the project's completion, Design Museum director Deyan Sudjic described the bridge as "a beautiful sculptural object". "Pawson's bridge is the antithesis of the muscular, structural gymnastics that have taken over the footbridge since the world of bridge design fell under the spell of Santiago Calatrava," he said. "It does not leap across water, showing every straining sinew. Instead it seems to float, a supple, unemphatic ribbon." To construct the bridge, a temporary causeway was built over the drained lake. Pawson's colleague Ben Collins acted as project architect for the bridge, while BuroHappold was the structural engineer. The name Sackler Crossing pays tribute to philanthropists Mortimer and Theresa Sackler, who funded the project. Other projects made possible by the pair include Zaha Hadid's Serpentine Sackler Gallery and the Sackler Building at the Royal College of Art.